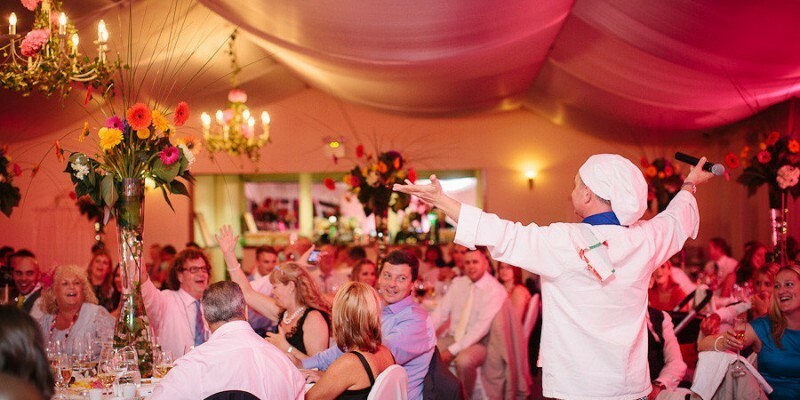 Singing Chef Marco is a multi-award-winning wedding entertainer from Ireland. His singing chef show has proved to be a firm family friendly favourite for any celebration. For over 15 years he has been the number one choice entertainer for discerning brides at home and abroad. Marco has performed over 5000 shows across the globe. From beach weddings in Dubai to the snowy Rocky Mountains of Canada. At glamorous celebrations on Sydney harbour to the French and Italian Riveras. On one weekend in 2015 he sang in Dingle Co. Kerry on a Friday then the Olympic Club, San Francisco on Saturday before flying to an event in London’s Guildhall on the following Tuesday. He is very proud to say he has never cancelled an event and has never ever been late. Marco has endured blizzards, floods and hurricanes and even walked 5 miles in the rain when his car broke down. So when you book Marco the singing chef you know he’s going to be there. Even if his plane is diverted to Atlanta and he has to take a flight to Denver just to get to an event in New York. It’s a fact that in 2016 he got to a party in a snow storm that even the guests or host didn’t make it to! Even Marco the singing chef has been a little surprised at the incredible demand that there has been for him since his debut on New Year’s Eve 2002. He loves his job. And entertaining you and your wedding guests. Maybe that’s one of the reasons for his success? Another reason is perhaps because he is never happy just to offer the same show time and time again. That is why he has continued to improve and adapt his routines. Marco is always looking for a new and innovative approaches for his surprise entertainment. In 2011 his singing pizza delivery guy made his first appearance at Brook Lodge, Co Wicklow. 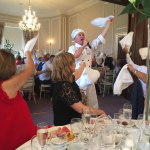 The singing chimney sweep wowed the guests in Mount Juliet, Co Kilkenny in 2013. There have been several incarnations of his Singing Waiter and singing wine expert routines. The original Singing Chef show was very much an operatic recital. This idea has grown and developed to include lots more popular and contemporary hits. The singalong and interactive nature of the show has always been at the heart of the performance. Whether he is shaving guests as the “Barber of Seville”, delivering roses as Mozart’s “Don Giovanni” or getting the groom to play the triangle while singing “Funiculi funicula” Marco is always looking for some new surprise and interactive angle. Some surprising recent additions to this song repertoire include “I will Survive” and “Big spender”. Some songs though are always included especially “That’s Amore”. Which is guaranteed to have your guests waving their napkins while singing along. Other recent improvements include a Disney Inspired Routine and a Musical Theatre tribute of some 25 songs in just 10 minutes! What Makes Marco the Singing Chef so Popular? The answer is easy it’s you and your guests. The Singing Chef knows that he is there to facilitate your enjoyment. Marco understands that fun and laughter are contagious and wonderful. So he offers you a show full of charm and humour. A fun presentation designed to get you and your guests smiling and singing. With the napkins flying in the air he will make your day an unforgettable party celebration. Combining his contagious personality and sense of humour. Beautiful singing and a show full of charm. The Singing Chef Marco offers an ever fresh, innovative entertainment which makes you and your wedding guests the real stars of your big day.